What is Zero-Net and Zero-Energy Design? Find out more here. Our mission is to integrate art, architecture and ecology. Our projects put people in touch with their environment, each other, and their spiritual and cultural aspirations. Our projects and practice allow us to realize this goal. Our new Zero Energy certified office showcases our values and approach. Indigo Architects are the First in the world to Receive a Zero Energy Certification Award for the design of an office building, and the 13th building total to ever achieve Zero-Energy Status. Located in sunny Davis we serve all of California including Sacramento, the Bay Area, the Central Valley and Western Region of the United States. Indigo's Candace Harrison, Selected to Speak at the Animal Care Expo 2019! The existing Dairy Queen was extensively reworked to provide 2,800 sf of architect office and studio. A 1,200 sf gallery and event space addition with a high ceiling and ample daylight is used for art openings, lectures, workshops and other community gatherings. The walkable, downtown Davis location situates the office close to the Davis Amtrak depot, UC Davis Campus, and numerous local businesses. 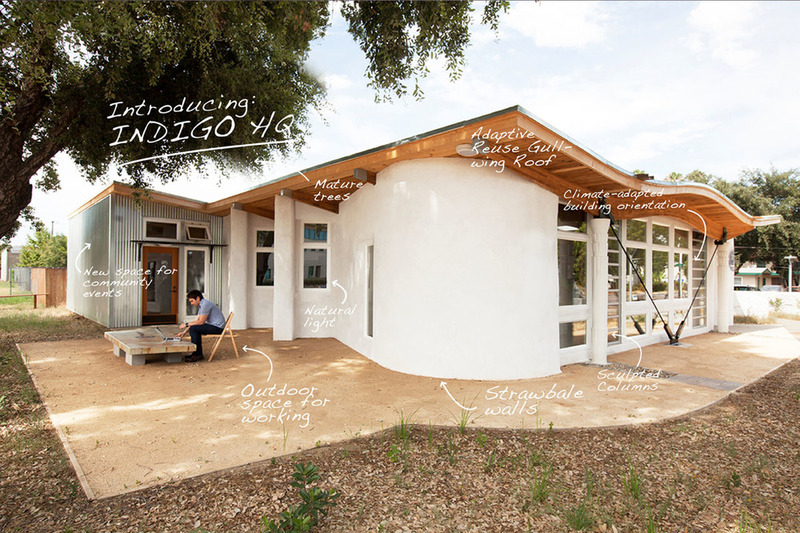 The “Barn” space is leased to ventures that resonate with Indigo’s mission. We designed and built our award-winning new office as a living model of our holistic philosophy, addressing the quality of human experience as well as the environment that supports us. We located our adaptive reuse office in walkable downtown Davis on the site of a former Dairy Queen built in 1967. The original gullwing, glue-laminated roofline is preserved and offset by curving strawbale walls. An addition clad in corrugated metal alludes to the agricultural vernacular of California’s Central Valley: barns and fruit-drying sheds. Our climate-adapted strawbale building captures 90% of its heating and cooling energy from the environment, transforming a local agricultural by product (rice straw) into a haptic and efficient building material. Our climate-adapted strawbale building captures 90% of its heating and cooling energy from the environment, transforming a local agricultural by product (rice straw) into a tactile and efficient building material. We designed an office building with the landscape in mind. Mature oaks on site were preserved during construction. Occupants have direct access to outdoor courtyards that are designed for working, eating and socializing: shady in summer; sunny and protected in winter; landscaped with drought-tolerant native and naturalized plants and sculptures created by the architects. Removable sails shade the courtyard; solar powered fountain provides cool water music. Structural columns were designed and fabricated by the architects harmonizing with curving straw bale walls clothed in luminous white lime plaster that took inspiration from existing midcentury gull wing glue-lam roof beams. Custom-designed building elements and furnishings are contrasted with an addition clad in austere corrugated metal that alludes to the agricultural barn-vernacular of the Sacramento Valley.